Paper Piecing a Digi Stamp---who knew I would attempt that? Can't keep a challenge junkie down. This is my first attempt, it's a little messy, but I think passable for a first. This digi is from Squigglefly. 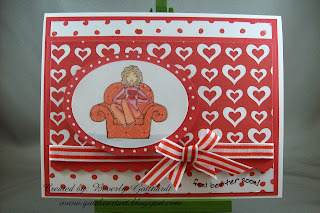 This is a project for people who like to do some fussy cutting. That's not a problem for me, I'm from the olden days before fancy cutting tools. As you can see I intended to get my paper in the printer so the little hearts would be up and down, but just about that time the phone rang and by the time I got back to my project I forgot to double check. My husband says,"Measure twice, cut once." Well, he also says I'm always rushing through life, so I need to learn to take a breath and pay more attention. A teachable moment. 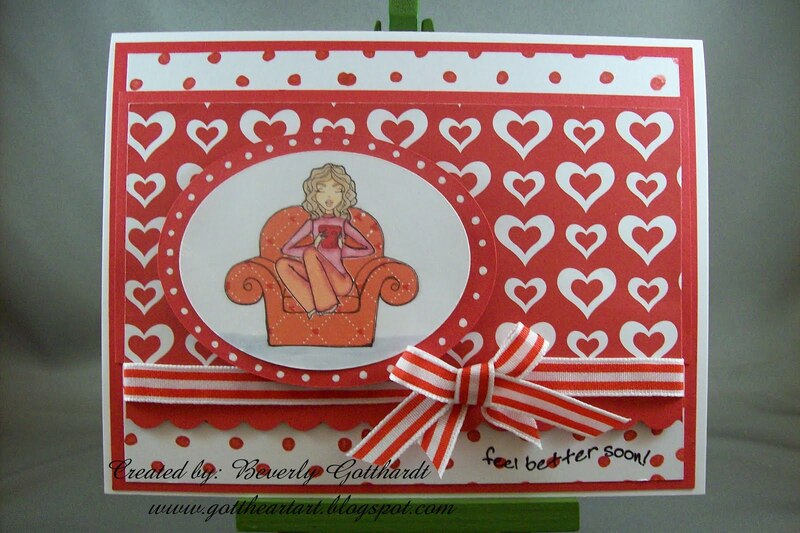 Supplies: White Card Blank 5" X 6 1/2" Halcraft, Papers: Georgia Pacific-White, GenerationsNow-Cardstock Stacker, paper on chair unknown, Stamps: Digi from Squigglefly, All Night Media-Dot Pattern, Hanna Stamps-Get Well, Ink: Stampin Up-Riding Hood Red, Copic markers, Ranger Archival Ink-Jet Black, Sakura Gelly Roll Pen-White, ribbon-Hobby Lobby, Fiskars Shape Cutter template-Ovals-1, Fiskars border punch-Scallop Sentiment, pop dots. Makes me want to curl up our my couch! Great job and thanks for playing with the Sweet Stop!